Here at SportsRock, we work to ensure that every child and family has a positive experience with us. Our coaches and staff have a passion for teaching and working with children. In the After School Program, we look forward to helping your child develop their physical fitness/ gymnastic abilities, create new friendships, build self-esteem through positive reinforcement, and most importantly, to have fun! 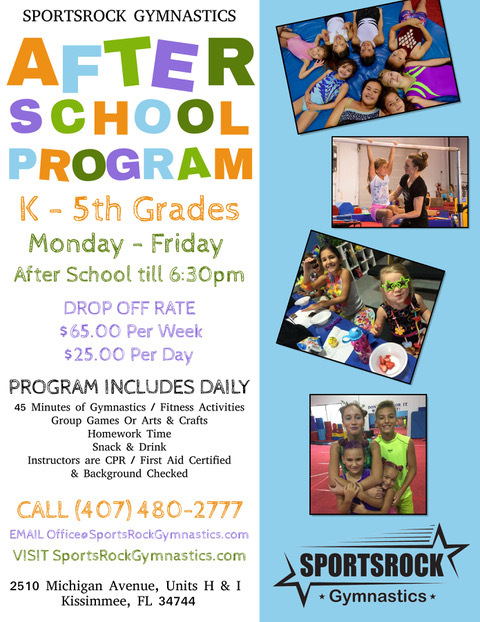 Our gymnastics after school program is offered during the Osceola County school year. The agreement is in effect for the entire school year. Here is some information and our policies. Please do not hesitate to ask questions. $40 Annual Registration fee the first year for one child, or $60 for a family. The annual fee is discounted by 50% every year after that. Using your own transportation (recommendations above) and dropping off at SportsRock is $65/week. Weeks cannot be split and there are no make-ups for days missed. Rates are based on one (1) calendar week. There is a $5 sibling discount weekly. A one (1) week deposit is required at time of registration for those full time students (3-5 days/week). The deposit will be applied to the last week of After School. Students coming 1 to 2 times a week will not need to put a deposit on file with us. There is a $10 late fee if the credit card on file is declined for any reason. In the event school is closed One (1) day during the week of service (i.e. Labor Day, Teacher Work Days etc. ), the weekly tuition is still due in full. When gymnastics camp is offered during single day school closures, you may chose to attend for a discounted price. Pick up is by 6:30pm. Student may only be signed out by an individual authorized by the parent on the registration form. Please be prepared to present ID at time of pick up. There is a $5 charge for pick after 6:30pm, beginning at 6:38pm. Every 15 minutes thereafter will accrue an additional $5 late fee. Fees are due in full each week. Full time students (3 to 5 days/week) are permitted five (5) Flex Days per semester (10 per school year). Flex days do not carry over from one semester to the next. These days can be used for any absence, for any reason. We will issue a credit for Only five (5) absences per semester. If any further days are missed, tuition is still due in full. There are no make-ups or credits for weeks or days paid for but not attended Beyond the 5 flex days. YOU MUST CALL AND NOTIFY US IF YOUR CHILD WILL BE ABSENT FROM SCHOOL AND/OR THE AFTER SCHOOL PROGRAM. There are never any monetary reimbursements of any kind, for any reason. Please keep in mind you are paying for a spot in the After School program, not the student’s attendance. Part-time students (1 or 2 days/week): You must commit to the same exact days each week. Changes to those days are based on availability. If you arrive without notice, service cannot be guaranteed. The only guarantee will be for students paid for by the Friday Before the week of attendance. You will have available two (2) Flex days per semester. Otherwise, we are holding your spot for you and payment is necessary regardless of whether or not the student attended. If you need to withdraw your child from the after school program, a one week written notice is required. The deposit will then be applied to the final week. Your child will automatically be withdrawn at the end of the school year. We will use your deposit for the last full week of school. Please be sure to pack the proper attire in your child’s backpack for physical activity. Girls can wear a leotard (biker shorts may be worn over the leotard if desired). No tights, midriff tops, jeans, bathing suits, or school uniforms, can be worn on the floor. Form fitting shirts and elastic waist shorts are acceptable. Also, please remember to throw away gum, remove any jewelry and tie hair back off the face BEFORE coming out onto the floor for warm up. SportsRock is not responsible for missing personal items. It is best to leave jewelry, etc. at home. Sometimes the behavior of one child may be unsafe or disruptive to the whole group. We have established these guidelines to handle these situations. If necessary, a parent will be called to pick up the child. If the behavior continues, a parent conference will be called to determine other solutions.